Three more federal judges, along with a district judge, have issued rulings barring authorities from deporting people detained at US airports following President Donald Trump’s executive order restricting entry to travelers from seven countries with Muslim-majorities. Judges in Massachusetts, Virginia and Washington state followed Judge Ann Donnelly from New York’s Eastern district in issuing their rulings on Saturday night and Sunday morning. The rulings limit the so-called ‘Muslim ban’ to varying degrees. Trump has rejected suggestions that the executive order, called “Protecting the Nation From Foreign Terrorist Entry Into the United States”, is a Muslim ban. The order indefinitely suspended the intake of refugees from Syria and blocked people from six other Muslim-majority countries - Syria, Iraq, Iran, Sudan, Somalia, Libya, and Yemen - from entering the US for 90 days. It also stops the admission of all refugees for at least 120 days while the government puts a new vetting system in place. Judge Donnelly temporarily blocked authorities nationwide from deporting immigrants when she ruled on a lawsuit taken by two men from Iraq, Hameed Khalid Darweesh and Haider Sameer Abdulkhaleq Alshawi, who were being held at JFK Airport. Next, Judge Leonie Brinkema, in the Eastern District of Virginia, issued a temporary restraining order giving all permanent legal residents detained at Dulles Airport access to lawyers, and blocking the petitioners from being removed. In the very early hours of Sunday morning two judges in Boston, Judge Allison Burroughs and Magistrate Judge Judith Dein, also imposed a seven-day restraining order against Trump’s executive order. The legal director of the American Civil Liberties Union (ACLU) of Massachusetts, Matthew Segal, described Burroughs' order as "a huge victory for justice." “We told President Trump we would see him in court if he ordered this unconstitutional ban on Muslims. He tried, and federal courts in Boston and throughout the nation stopped it in its tracks,” Segal said in a statement. 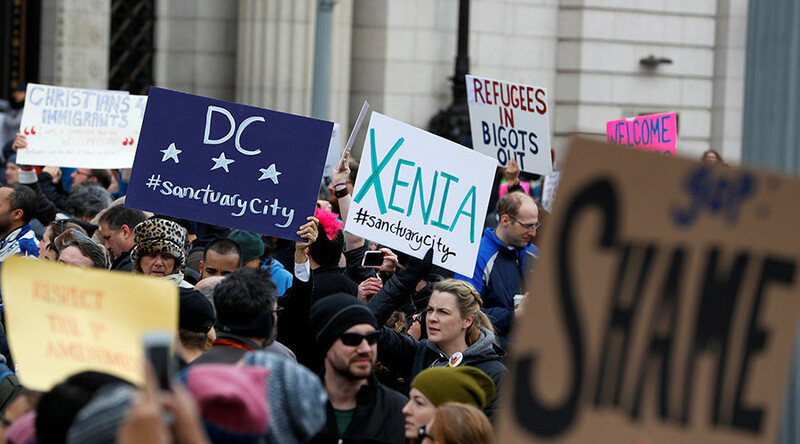 District Judge Thomas Zilly, in the Western District of Washington, issued another order stopping any deportations on Sunday morning. These overnight rulings immediately blocked enforcement of the ban to various degrees. The Department of Homeland Security issued a statement on Sunday saying it would comply with court rulings while at the same time implementing Trump's order "to ensure that those entering the United States do not pose a threat to our country or the American people." “Prohibited travel will remain prohibited, and the U.S. government retains its right to revoke visas at any time if required for national security or public safety,” the statement read. “The judge in Brooklyn, the Obama appointee judge in Brooklyn’s stay of order really doesn’t affect the executive order at all, because the executive order is meant to be prospective… It’s preventing not detaining,” she told Fox News.